Every Cambodian passport has to have a particular kind of photo, or it won't be official. My Passport Photos is an excellent way to take the photo you need since we have vast experience with Cambodian passports. Find all the specifics by looking at our Quick Facts section, and then utilize our service to take a photo you can use. If you plan on using your Cambodia passport to travel, make sure to check out www.ivisa.com as well. It can tell you if you’ll need a visa where you're going, and give you the time you need to get that taken care of properly. Size: 2x2 inches or 50mm by 50mm. Color: Color or black and white allowed. Head should measure 25mm to 35mm from chin to forehead. 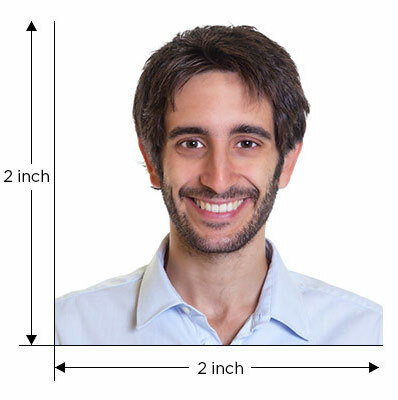 Head size and position: Centered and squared with camera. Recency: Taken within the last six months. Background: Plain white or off white only. Smile: Natural expression. Mouth closed. Eyes: Wide open and looking at the camera. Glasses: Prescription only so long as eyes are visible. Headgear: Religious or medical reasons only. Dimensions and size (pixels): Minimum 400x600 and maximum is 800x1200 pixels. No larger than 1MB. JPEG, PNG or BMP format. Attire, clothing, dress code: Avoid white or light colored shirts. Sizing is extremely important and cannot be stressed enough. If the photo is not the exact size, it will be rejected. Unlike most other countries, you can opt to have your photo done in color or black and white. B&W should be as natural looking as possible and reflect your true features. Smiling is acceptable as long as there are not teeth showing. Use a small crease of the lips or keep a neutral looking face. No hats, large jewelry or hair pieces are allowed in the photo. However, if you wear a headpiece for religious or medical reasons, it cannot block the face. Hair must be swept back behind the ears and not cast any shadows on your face. Sunglasses, tinted lenses or glare are not permitted. Prescription glasses can be worn if frames are thin and eyes are fully visible. Red eye can be a problem if a flash is directed in line with the eyeball. Should this occur, retake the photo as digital alterations of ANY kind are prohibited. Be conscious of lighting. A picture too dark or too light is usually the common cause of rejection. Be sure no flash creates a reflection on the background or person. Keep lighting even in order to show true skin tone color and features. Though not specified, avoid wearing white or light colored clothing as it will not create a definitive contrast of person to background. Eyes and shoulders should be completely squared with camera. Photos should be printed on high quality paper. A child or infant should be squared off with the camera. Eyes need to be opened and mouth closed. If you are holding your child, hands or other objects cannot be visible. Use a plain, white cloth to cover the background. This is especially useful for floors and car seats. Pacifiers, bottles, blankets or toys are never acceptable in the picture. Double check the lighting. Again, a picture too dark or too light is an automatic rejection. Shopping around for a place to get a passport or visa photo has never been easier than it is these days. The Internet has created a land of opportunity and convenience. Though you may opt to keep a more traditional method of passport or visa photo taking such as a post office. This is perfectly acceptable if you don’t mind driving around, waiting in lines and higher costs. There is no reason to pay ridiculous costs when technology has made the way for digital photos. At MyPassportPhotos.com, you can get a set of pictures for 25,802 KHR. Should you go with a post office, the cost is more like 61,420 KHR a set. If you have a family you’re planning to take with, wouldn’t you rather save more money for the trip? We pride ourselves on getting you high quality passport and visa photos quickly and conveniently. At MyPassportPhotos.com, we guarantee 100% government compliance on all photos submitted. Simple and easy to use, our passport photo booth allows you to take a photo from anywhere using a smartphone or tablet. Not happy with the image? Retake as many as you please at no additional charge. Once finished, you have the option to pick up photos at a store or immediate download. Should you encounter an issues with the website or have any questions, our friendly staff is standing by to answer. Take the photo, submit and let us take care of the rest.